Lab on a Bead has compiled an Application Note in cooperation with researchers at the Science for Life Laboratory at KTH, Stockholm, Sweden, where LOABeads MabBind A were used together with a KingFisher™ Flex robot, to purify expressed scFv antibody fragments from 500 ml bacterial cultures. In this study, four different recombinant scFv proteins were handled in parallel. 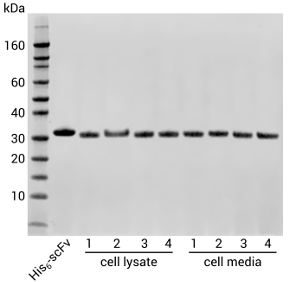 The scFv-constructs contain an ompA-signal, directing the translated protein to the perisplasmic space, with a fraction leaking out into the cell culture media. LOABeads PrtA30 were efficiently used to purify both the cellular and extracellular fractions of the scFv protein. For cellular scFv, the magnetic beads were incubated in 10 ml of completely lysed bacteria. Subsequent washing and elution were performed using the KingFisher Flex robot. For extracellular scFv, LOABeads PrtA30 adsorbed the expressed protein in the 500 ml harvested cell culture media and initial separation of the protein A beads was handled in a LOABeads MagSep500 magnetic separator. The beads were then resuspended in smaller volumes, with washing and elution performed using both LOABeads MagSep50 and a magnetic rack for microcentrifuge tubes. Both setups yielded highly pure protein from all clones (picture above). An ELISA test showed that the scFv remained active when neutralized after the low pH elution.